Until yesterday, embedding a Khan Academy video in your blog or website meant giving up features like point-tracking and multilingual subtitle support, by using YouTube’s default embed code. 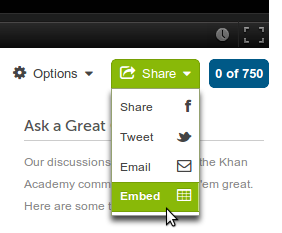 Now, using the Share > Embed option below a video on Khan Academy gives you embed code that allows you to provide a richer Khan Academy experience directly from your own site, allowing viewers to earn points, track progress, and view subtitles in multiple languages. We’ve also worked with embed.ly to make linking and embedding Khan Academy content through other websites and services even easier, such as through their Wordpress, Drupal, or Joomla plugins (and see here for an API example). Now – go forth, and get embedding!